The Innovation Award is given to an employee or a group of employees in Grundfos who, in the course of the year, have made a particularly creative and innovative contribution within one of the following areas: technical innovation, business development, process development or sustainability. 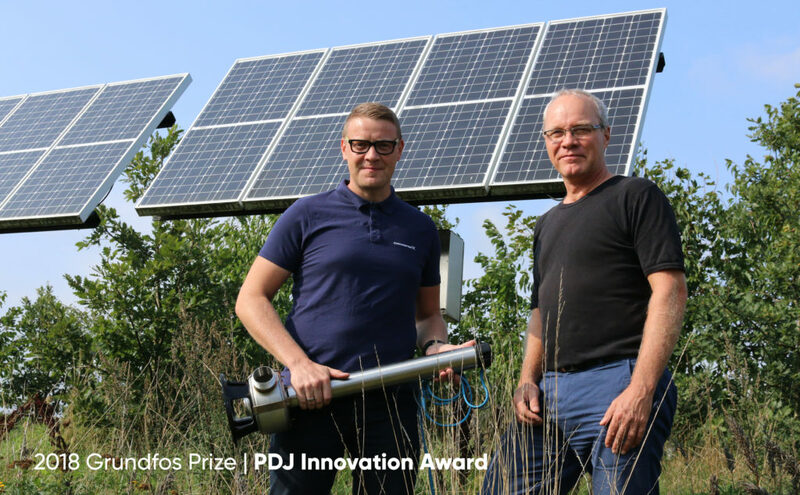 The jury awarded the 1st prize to Thomas Schiøttz Christensen and Ejgil Koustrup for their project “Technology innovation AP Flex”. Clean drinking water in developing countries has been a focus point for years. But what about the wastewater? In order to provide healthy living conditions, you need to ensure hygienic handling of wastewater. The AP flex is a unique high-speed solar-powered wastewater pump, developed using very few resources by re-using and combining solutions from existing Grundfos products. 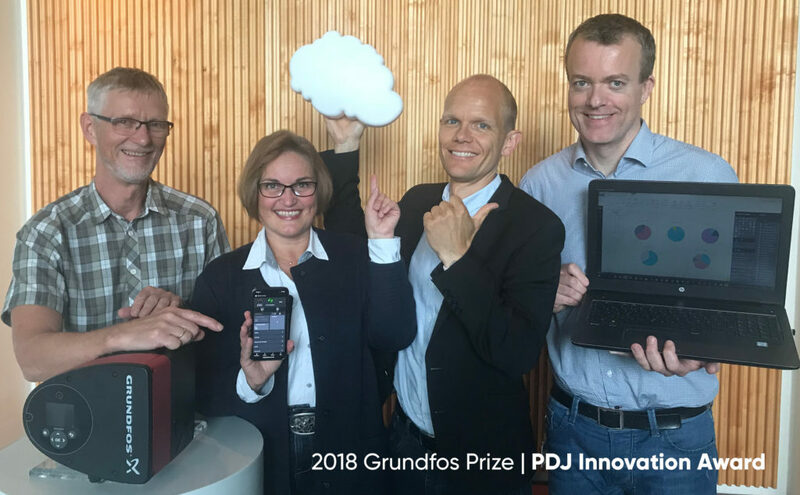 The jury awarded the 2nd prize to Rasmus Kjær Ursem, John B. Jacobsen, Allan Agerholm and Dorte Kjeldbjerg Lund for their project “Grundfos GO remote app and block of data analytics code. It might not yet be fully explained what it means to be a “data driven pump company”, but one thing is sure: it involves relevant data harvesting, and the ability to match data and user behaviour. Since only a fraction of the pumps we sell today are connected, we need a way of bridging the “data gap”. This app does exactly that and serves as the link that connects the pump and Grundfos, after it has left our premises. 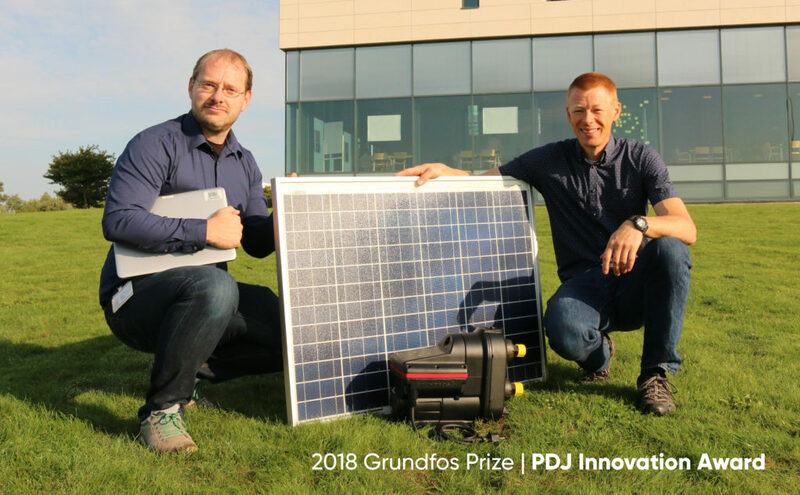 The jury awarded the 3rd prize to Daniel René Pedersen and Bjarne Søndergaard Henriksen for their project “Motor control with integrated solar algorithm”. In order to maximize the benefit from photovoltaic solar cells, the receiver must constantly adjust its parameters according to the solar intensity. If a cloud temporarily reduces the sunshine, the electric circuit should adjust the pump in order to maximize power extraction from solar radiation. This software solution requires no extra hardware and uses the existing hardware in a smarter way, thus maximizing the sustainability by making sustainable solutions more accessible.